Founded on June 23, 1938 by Félix Pérez de la Serna, Leganés was a continuation of the C. D. Once Leones project. By the mid 1950’s, the club had moved through the various categories and made their way up as high as the Tercera Division in 1954. In 1966, the Estadio Municipal Luis Rodríguez de Miguel was inaugurated but a see-saw existence between the regional divisions and the Tercera continued until they began life under José Díaz Pablo in the Segunda B in 1987/88. Their rise continued and after finishing first in 1992/93, Leganés were promoted to the Segunda for the first time in their history, a 3-0 play-off win against Elche on June 27, 1993 sealing their ascent. A move to Estadio Municipal de Butarque was made in February 1998, and a home defeat to Córdoba on the last day of the 2004 campaign saw another relegation. That year, Daniel Grimbank, an Argentinian businessman, had bought the club and began to restructure it, before abandoning Leganés entirely in the second half of the season. Jesús Polo and D. Rubén Fernández steadied the ship, before Felipe Moreno and Victoria Pavón paid off all of the cub’s debts in 2008/09 to avert a crisis which could’ve ended with the club going out of business. A longed-for promotion back to La Segunda came in 2014/15, and then, just two seasons later, a first-ever ascent to La Primera. Asier Garitano had led his side to the promised land, with centre-back, Pablo Insua, scoring the goal to send them to the big time. The first shirts that were worn by Leganés were Blaugrana, along with white shorts. This colourway was used from the club’s inception in June 1928 to the mid 1940’s. Then the kit was changed to green and white, to give more prominence to their nickname and the relation with everyone born or living in the city. From 1954, the definitive change to blue and white, to represent the city, was made, and Leganés have kept the same colours ever since. FC Barcelona and Leganés have met on five previous occasions, dating back to September 2016. On that occasion, the Blaugranes emerged from Butarque with a 1-5 victory. This was followed by a 2-1 win at the Camp Nou, and Barça also managed to beat Los Pepineros on both occasions last season; 0-3 away and 3-1 at home. 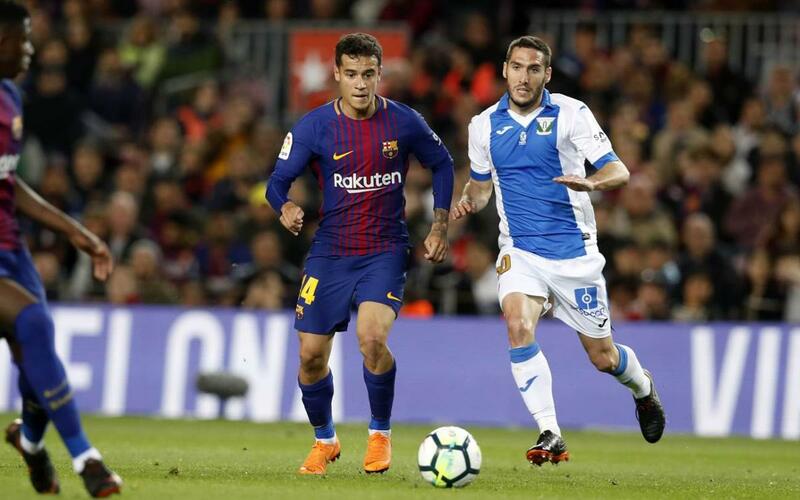 Leganés’ only win in the fixture came earlier this season, when Philippe Coutinho’s 12th-minute opener was cancelled out by two goals in a minute from El Zhar and Rodríguez (2-1). In the last dozen games in all competitions, Barça have lost just once, against Levante in the first leg of the Copa del Rey tie. Clean sheets have been achieved in half of those matches with three or more goals being scored on five occasions. Leganés have won five games over the same time period, including away at Real Valladolid and Rayo Vallecano. They’ve kept clean sheets in three of their last six matches which included a Cup victory over Real Madrid. Former Barça B player, Rodrigo Tarín, now plays for the Madrid-based club, as do other former Blaugranes, José Arnaiz and Gerard Gumbau. Martin Braithwaite, who joined Leganés on loan from Middlesbrough at the start of the month, was the scorer of the goal which defeated Los Blancos, just a couple of weeks after signing. Youssef En-Nesyri and Nabil El Zhar will give the visitors some pace up front, whilst the combative Allan Nyom is back in La Liga on a loan deal from West Bromwich Albion. Mauricio Pellegrino played for Barça on loan from Vélez Sarsfield back in the 1998/99 season under Louis van Gaal, making his debut on September 12, 1998 in a 1-0 win over CF Extremadura. Valencia, Liverpool and Alavés would also be playing destinations, and Pellegrino would go on to coach the two Spanish sides, as well as Estudiantes, Independiente and Southampton.